Dancing DJ Productions is starting off the year with some amazing and unique events! Alex and Juan’s wedding at Green Gables Wedding Estate was certainly one to remember. The music for the ceremony prelude was performed live by a mariachi band, which was a lively way to welcome guests. After Alex and Juan exchanged vows, the band was back to serenade everyone during cocktail hour. 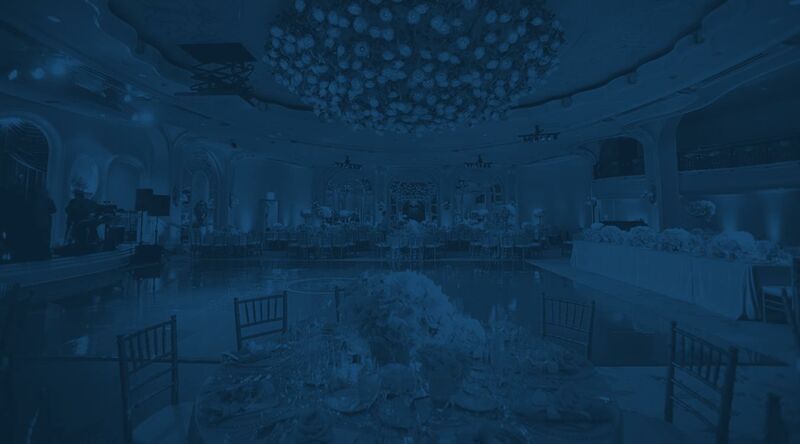 The colors for the wedding were copper and teal, which we complemented by using our teal uplights. The uplights looked great over the hedge wall they have at Green Gables Wedding Estate. It really is the perfect backdrop! Once the guests were settled and had found their seats, the wedding party had their grand entrance to “Shut Up and Dance” by Walk the Moon. It’s always great when a couple chooses a fun song for their grand entrance. It really gets the guests in the party spirit. The grand entrance was followed by the couple’s first dance, and then Alex and Juan chose to give the welcome speech themselves … a unique choice. Then guests were invited to give toasts to the newlyweds. The toasts were all very heartfelt. You could really feel the love in the room. The dance floor was open to the guests after the traditional parent dances, and the party began! We played an awesome mix of Latin, reggaeton and flamenco which the guests really responded to. Requests for some fun sing-a-longs capped the night and soon the party was at an end. All in all, a great event to help kick off our new year! Thank you so much, Alex and Juan for letting us celebrate with you. We hope you have a wonderful journey together! Think this venue would be perfect for your event? Check it out here. Or find our venue page here.